Professor George Kanarakis OAM will present ‘Interlanguage contact: The diachronic contribution of Greek to enrichment of the English language’, on 26 April from 7pm. 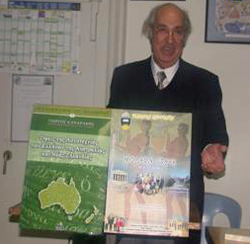 Professor Kanarakis is an Adjunct Professor at Charles Sturt University. View further information about Professor Kanarakis (.pdf). This free lecture takes place from 7pm to 8pm in room 5, building 24 (24.05), Casuarina Campus, Charles Darwin University. Everyone welcome - further enquiries 8946 7450. This lecture is hosted by the Charles Darwin University School of Creative Arts and Humanities - Greek studies.